I started in my new role as the Director of the Tata-Cornell Agriculture and Nutrition Initiative just over a month ago. This Cornell University initiative has been set up with a generous endowment from the Tata Trusts to take on an enormous challenge: addressing the problem of persistent malnutrition and poverty in India. Our task is to build an action research program and an evidence base on the effective agricultural pathways to improving nutrition and reducing poverty in rural India. Over the next six weeks, I will be traveling in India, much of that time in rural areas, trying to get a bottom-up sense of the problems along the agriculture-nutrition pathway and implications for our overall agenda and priorities. The Tata-Cornell initiative comes at a time when agriculture and nutrition are at the top of the policy debate and political agenda in India. The global food price crisis of 2008 brought attention back to agriculture and the need to ensure stable food supplies. The continued tightness of the global food markets and the upward pressure on food prices are shifting the policy focus away from short-term measures, such as the rice export ban implemented in 2008, towards long-term productivity improvement strategies. At the same time, there is growing realization that despite strong economic growth, the incidents of poverty, hunger and malnutrition continue to be stubbornly high, and require deliberate actions that address the agriculture-nutrition nexus for the lagging regions and the people left behind. Policies that attempt to improve the poor’s access to food are receiving renewed attention. In designing a research agenda focused on the agriculture-nutrition nexus in India, we are faced with the enormous diversity and complexity of the country at all levels. Rising school enrollment rates, especially among girls, yet women’s empowerment is lagging behind. ICTs and the “unique biometric ID program” are improving the targeting and effectiveness of nutrition and safety net programs, particularly for women and children in the poorest households. While in India I will be traveling through rural areas of states with persistently high poverty rates, conducting group interviews with village communities, and visiting ongoing governmental and NGO efforts to improve agricultural productivity and reduce malnutrition levels. While I believe agriculture and food based solutions are important, clean water and sanitation investments as well as behavior change interventions, especially women’s empowerment and education, play an essential role in ensuring rapid and sustained improvements in nutritional status. I hope to return from India in mid-August with a clearer sense of what a U.S. based university and our new initiative can do to help address a problem that several other important groups, national and international, have grappled with for decades. 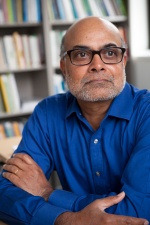 I hope to identify 3-5 areas of expertise and the comparative advantage that Cornell University can bring to the table, and to build partnerships with other groups that are on the same quest of finding a sustained pathway to reducing poverty and malnutrition in rural India. I will be posting my thoughts and reflections as I go.